With the recent bushfires in New South Wales it isn’t surprising that a good number of people have been hitting up the Rural Fire Service website to find out what is going on. Unfortunately, the demand has been so high that the RFS website has buckled under the strain leaving its Twitter account to pick up the slack. 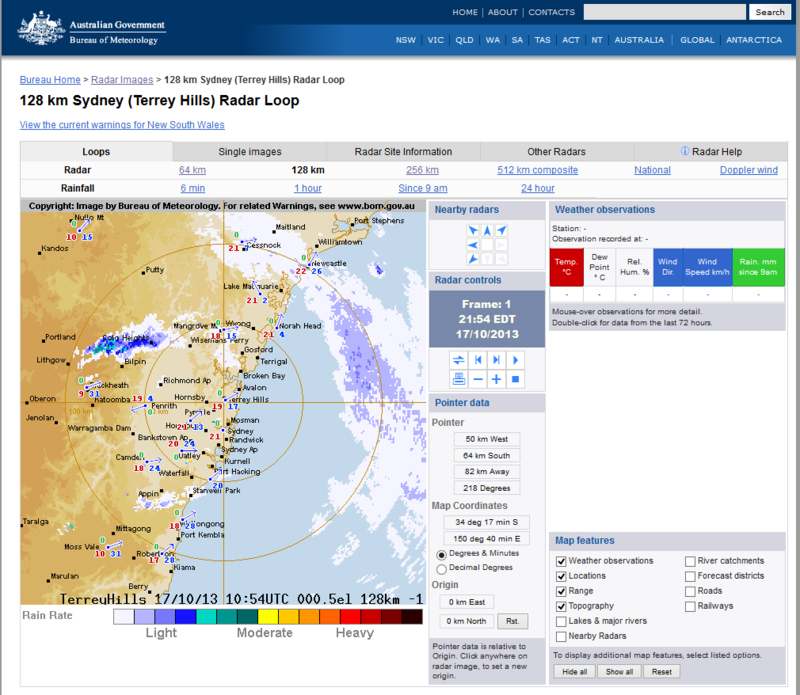 However, you can use other unlikely sources to potentially help work out the trajectory of a fire and one such tool is the BOM website – specifically the rain radars. The above was captured on 18/10/2013 and on the left you can see something that looks like rain just north of Bilpin and East of Lithgow. However, that was not rain but smoke causing an echo on the rain radar. I also enabled the option for weather observations to show wind direction and you can see at Lockheath there was a WSW wind (that is to say wind originating from a WSW direction and heading ENE). Given the incredibly high winds on that day at up to 90km/h it was somewhat reasonable to expect the fire to move primarily in that direction. Of course, this is not a bulletproof means of tracking fires – this method only allows you to see the smoke and perhaps determine where the fire is burning. You won’t be able to see where the fire has already been particularly if the wind direction changes. If you have any doubts about fires nearby you should try to check the RFS website or call the RFS on 1800 NSW RFS (1800 679 737). If you need to report a fire then always call 000 (in Australia).